There are many ways to scale applications. Sometimes it helps to have a good visual guide that can accommodate all of the possibilities when it comes to scaling your application. 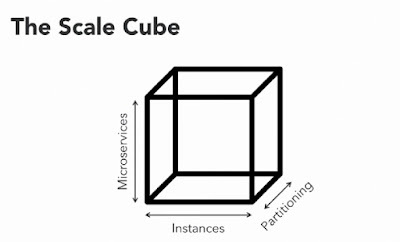 The scale cube is a diagram that is a good tool for visually understanding all the ways in which our applications can be scaled. It was originally introduced in the book, The Art of Scalability, by Martin Abbott and Michael Fisher. The bottom left corner of the cube represents the least scaled application possible, a single instance monolith. This means you have one application running in a single instance on a single computer. As we scale our applications we move closer to the top right hand corner of the scale cube. Applications that are closer to the top right hand corner of the cube should be able to handle massive amounts of traffic. The X axis of the scale cube represents cloning. This means running multiple instances of an application and splitting the traffic between those instances. The closer we are to the left side of this axis the fewer instances we have. All the way over on the left side we might only have a couple instance running on a single machine. The more we move to the right on this axis the more instances we run. We can split our application up into many instances that run across many different machines even across different data centers around the world. At a certain point the data that our application stores will run out of disc space and or memory. Or maybe the database traffic will become too great to handle with a single database. The Z axis represents scaling the data capabilities of our applications. On this axis we'll split our database up into several instances that are only responsible for a part of the whole dataset. Along the Y axis we break monolithic applications up into microservices. This means dividing the application into services that are designed to focus on a single feature and work together with other services to compose the functionality of our entire application.